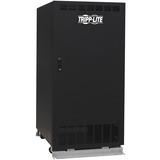 Tripp Lite's SVX90KL 90kVA / 90kW SmartOnline® Small-Frame UPS includes installed Input, Bypass and Output breakers, a Static Transfer Switch (STS) and 3 included 30kVA SVX30PM power modules. 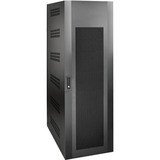 This is the maximum configuration supported by the SVX Small-Frame UPS series. 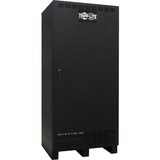 External ±240VDC batteries required (sold separately). 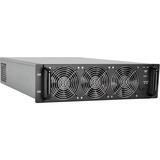 Featuring a modular, scalable design with high-efficiency voltage and frequency independent/VFI operation, Tripp Lite's SVX Series SmartOnline UPS systems are ideal for the protection of a wide variety of critical IT systems. 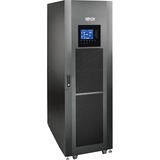 Scalable, modular configuration enables UPS capacity upgrades and hot-swap power supply maintenance without costly downtime. 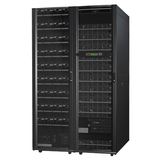 Over 95% efficient in standard online mode and over 99% efficient in optional economy mode enables reduced operating and cooling costs. Unity power factor configuration provides equal kVA and kW output ratings for up to 25% more wattage capacity than common 0.8 - 0.9 power factor competing designs. 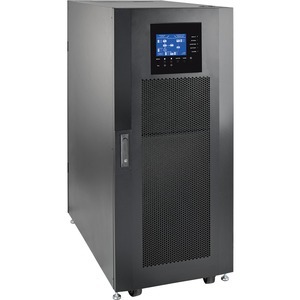 Network-grade sine-wave AC output with 1% output voltage regulation and less than 1.5% output total harmonic distortion. Advanced IGBT inverter with Digital Signal Processor (DSP) technology provides for less than 3% input total harmonic distortion (THDi) to support 1:1 generator sizing. Dual-input hardwire design enables operation from one or two input power sources for enhanced system availability. N+1 fault-tolerance is configurable anytime there is an "extra" SVX30PM 30kW power module installed beyond the minimum required quantity. Automatic and manual bypass options keep connected equipment operational during routine maintenance or critical power module failure.